The Trophy Bonded Tip bullet is used in a few Federal Premium Ammunition lines – the Trophy Bonded Bear Claw, Trophy Bonded Sledgehammer Solid, and the Trophy Copper. While each of these ammo lines differs slightly, there’s one thing they all have in common, and that’s the tip. This bullet and its tip were created for one purpose – to take down large, thick-skinned animals (we’re talking African game). These bullets have great features that enable massive penetration and expansion, like a large and very accurate hollow point. Polymer Tip: The distinguishable yellow tip was created to penetrate thick hides and to help the bullet expand. The way the tip is shaped also adds to the ballistic coefficient. Boat Tail: The boat tail is a must-have for extreme range to keep your distance when hunting large, dangerous game. Snipers recommend boat tail bullets for long-range accuracy, and hunters have made them a staple. Solid Copper Shank: The solid copper shank gives you top-of-the-line penetration and reliability on a consistent basis. The other advantage of the copper shank is that it loses less weight from fragmentation than traditional bullets, allowing for superior penetration. This is a big-game bullet found mainly in large rifle calibers. Two ammo lines from Federal are the Sledgehammer and Bear Claw, which are also big-game bullets. 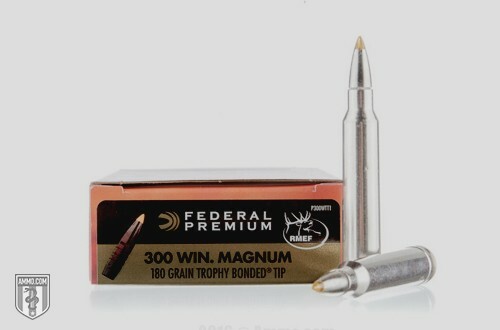 Any ammo using this bullet will tear through a big animal and devastate it internally. While perfectly usable for deer, moose and bear – using this bullet on smaller game is not what it was intended for because of its deep penetration. This style of bullet is one of the high points of big-game hunting technology. Reviews of this bullet are almost all positive, with some great African hunting tales to go along with them. The reported accuracy with ammo using the Trophy Bonded Tip is very impressive. And it’s not uncommon to have baseball-sized grouping at very extreme ranges over 500 yards.